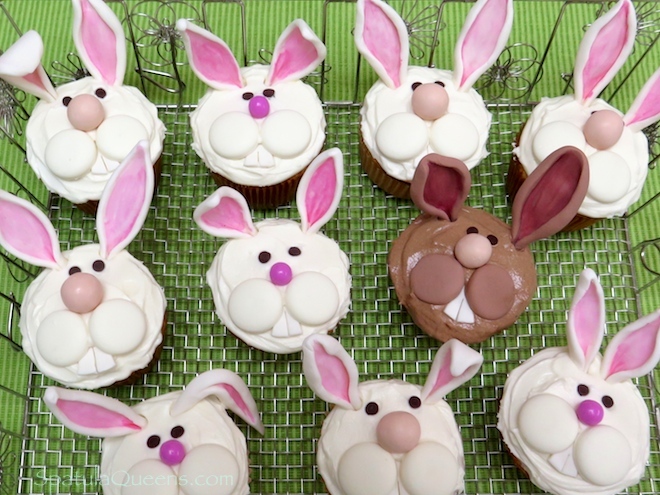 This winter, we started a little animal cupcake project so what better way to celebrate the arrival of spring than Funny Bunny Cupcakes! We asked our artist-in-residence, Cheeko Douglas, to design a series of animal cupcakes using candy for faces with a little hand-shaped fondant for things like ears. Since Cheeko is not a baker, we created this bunny cupcake to inspire her – watch this space for her results, they are gonna be fun. 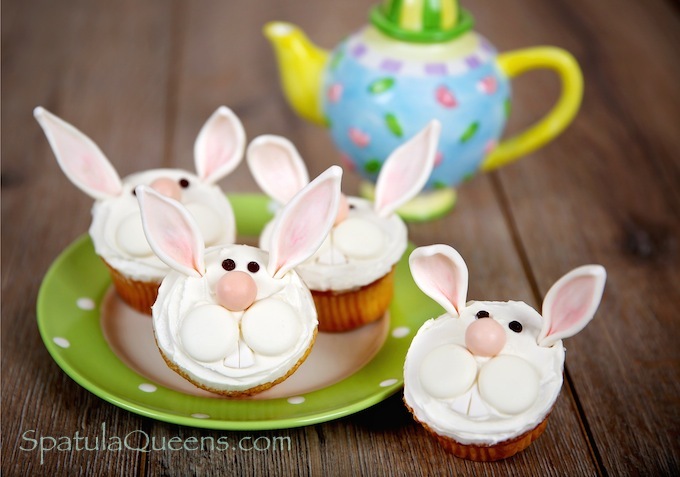 For these Funny Bunny cupcakes, we started with a yellow cupcake recipe that we find to be sturdy enough to handle the decorations. The one we share below is adapted from the Joy of Baking. There are thousands of yellow cupcake recipes and in our opinion, the best is the one you have tried and tweaked to work in your own oven with your favorite flour, measuring and mixing techniques. Any favorite frosting should work; we tried it with several buttercreams and think a recipe that doesn’t require refrigeration is best (so you don’t have to deal with all the moisture from sweating when you set it out to serve). 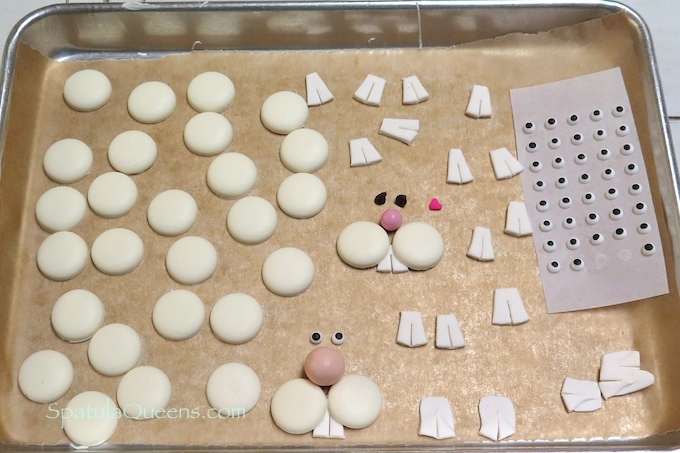 The bunny ears and teeth are made with ready-to-use rolled fondant that can be purchased online or at most hobby stores that carry cake decorating supplies. You will need a piece about the size of a marble for each ear and just a tiny bit for the teeth. Important: the ears need to be made at least two days ahead so they can dry enough to push into the cupcakes without breaking. 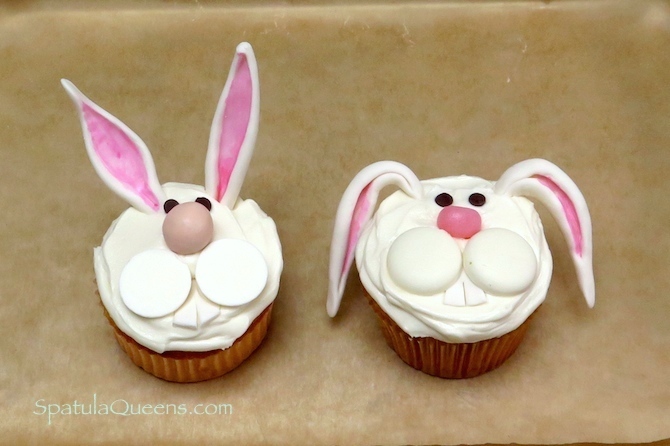 While the cupcakes can be decorated ahead of time, don’t insert the ears more than about 3 to 4 hours before serving because the moisture in the cake and frosting will be absorbed by the fondant ears, causing them to break. Someone suggested reinforcing the ears with toothpicks but we are against putting anything into a decoration that isn’t edible. Roll a marble-sized piece of fondant onto a ball and roll it into a slender log, about 2 inches long. 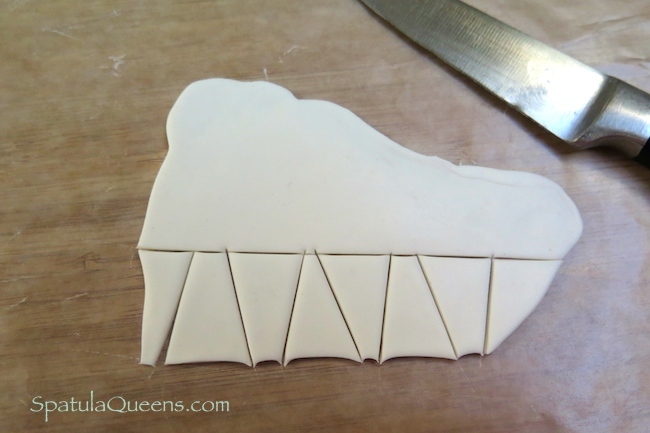 Using a fondant modeling tool to flatten and shape it into an ear. To color the inside of the ear, use a drop of pink food color in a little clear alcohol, like vodka, or lemon extract. Let these dry for at least two days. 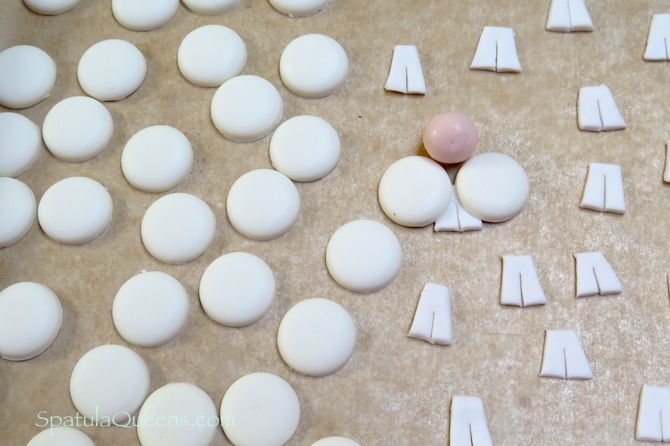 Test your color on a tiny piece of fondant and thin with a little more alcohol if you want a paler color. 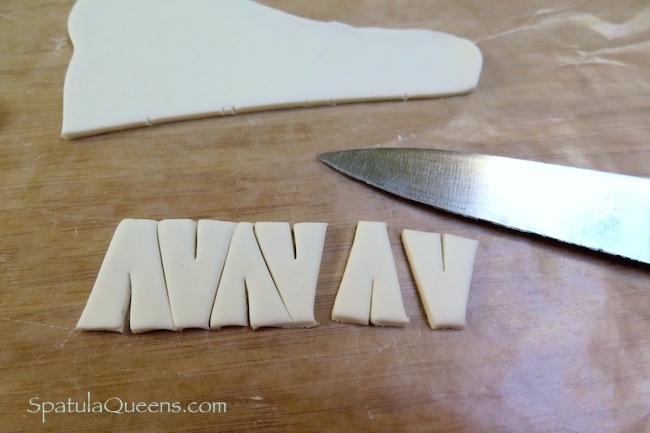 To create the teeth, roll a small piece of the fondant onto a non-stick surface (we used waxed paper) and cut with a paring knife. Let these dry so they can be handled easily when decorating the cupcakes. The bunny cheeks were a big deal. We were inspired by Bakerella‘s Groundhog Day cupcakes, but she used boxed candy that comes in chocolate and we wanted off-white. 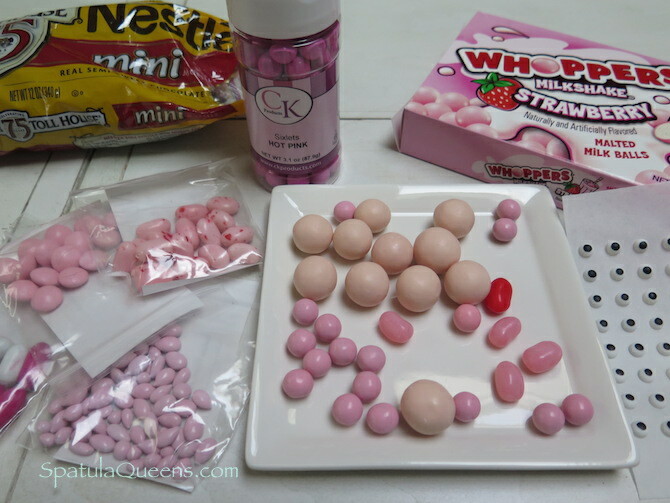 Bagged candy melts, a product available at cake decorating supply stores were the right size but one side had a peak and the flat side was, well, too flat. If you want to see some of the Spatula Queens drawings by Cheeko Douglas, check out our Pinterest boards and don’t forget to Like us on Facebook. A yellow cupcake, sturdy enough to support the decorations but moist and flavorful. Instructions for creating decorations are on the SpatulaQueens.com blog. These cupcakes can be made ahead and frozen until ready for use. This recipe was adapted from the Joy of Baking with these changes: used 2 whole eggs instead of one egg plus two yolks. Plain yogurt didn't work - the cupcakes were dry. Also, we made 14 instead of 12 cupcakes to achieve a more manageable size for decorating. Pre-heat oven to 350 degrees (325 for convection). Whisk flour, salt, baking powder in a bowl and set aside. In mixer fitted with paddle, cream butter and sugar until light. Add vanilla and sour cream and mix until incorporated. 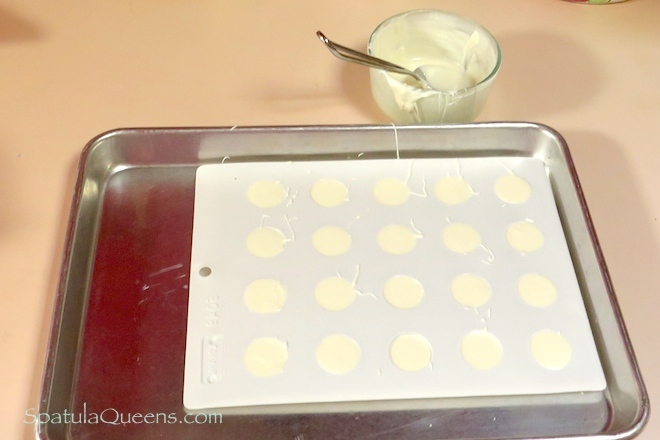 Divide into 14 cupcakes liners and bake at 350 degrees for 15-20 minutes until done.